In this collaboration elements of installation by Emma Hammarén are combined with methods of electronic sound creation by Jockel Liess. The work builds on structural music scores, graphic notation and conceptual composition, and its free interpretation by the musician or artist. The starting point is the development of a “virtual instrument” by Jockel Liess, capable of playing one octave, containing 15 individual notes, and a structural music score for its acoustic manifestation. Emma Hammarén takes the role of the interpreter, and creates a 3 dimensional sculptural notation, determining the audible notes and their parameters, subject to the given rules and restrictions. This is a physical representation, constructed without any specific musical references in mind, and purely based on the unique sense of aesthetics and principles, which underlie her work. Her first step in doing this is the translation of the tonal scale into 15 different objects, each one of them representing one specific note in the octave. 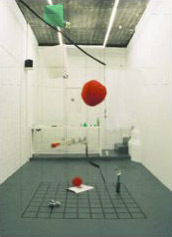 The arrangement of these objects in the gallery will establish the played melody, with the height of the room representing time and 1 cm equalling 1 second, starting at the floor and moving upwards. The positioning of each object in relation to the grid on the floor determines the volume and panning of each played note. In addition the height of each individual object determines the notes length and the shape determines its attack and decay. Finally, the score is translated back into audible sound by Jockel Liess and played in the gallery.